OS grid reference SD 7323 3616. 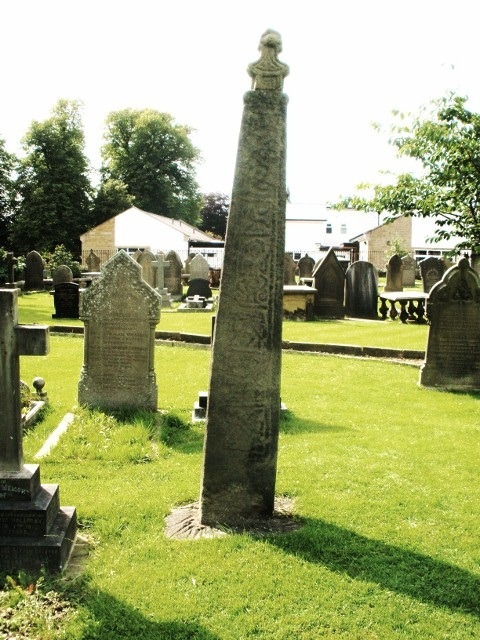 In the churchyard of St Mary & All Saints parish church, off King Street, Whalley, in the Ribble Valley are three late Anglo-Saxon sandstone crosses, one in particular is richly carved, but the other two are now showing signs of erosion and, even damage. They all date from the 10th-11th centuries and are often referred to as being Anglian, though two of the crosses display what is probably Norse influence. The three crosses are often thought to be associated with St Paulinus who came to Whalley in the 7th century AD and used them as preaching crosses, but this is thought unlikely. He may, however, have established the first wooden church here on this very site, though the present-day church is largerly a medieval structure, dating from the beginning of the 13th century. It is well-worth having a look inside the church because there is, amongst it’s many treasures, a Roman altar with a carving of the god Mars, a grave-stone ‘supposedly’ belonging to John Paslew the last abbot of Whalley abbey who was executed at Lancaster in 1537 for taking part in the Pilgrimage of Grace, and also the tombstone of Peter de Cestria, the only rector of Whalley (1235-96). There is an inscribed Roman stone set into the inner archway over the north doorway that has an inscription: FLAVIUS VOT OMPOSU and is probably from the late 3rd century AD. The yellow gritstone font is 15th century. Outside the church adjacent to the south porch there are two hollowed-out stone coffins from the 13th century and near those a large stone block that may be the base of a Roman pillar. The churchyard sundial on a stepped base bears an inscription: LAT 53 40 AD 1757 and another date 1737 – the dial was purchased in 1738. Cross No I (The Western Cross) is decribed as a panelled cross and is just under 3 metres high (9 foot 6 inches). This cross dates from the late 10th to early 11th century and is the earliest of the three. It may have replaced an earlier wooden, painted cross. It displays a strong Anglo-Norse influence in it’s carvings, although now rather worn. There are six panels on the east face – the third middle panel shows a saint in prayer with up-raised hands, or it may be Christ, standing between serpents; another panel has a pelican and another shows the symbol of eternity ‘The Dog of Berser’ the Christianised Scandinavian emblem representing the creator. In the top panel there is a dove representing the Holy Spirit. And there is also the usual interlacing and pattern-work. 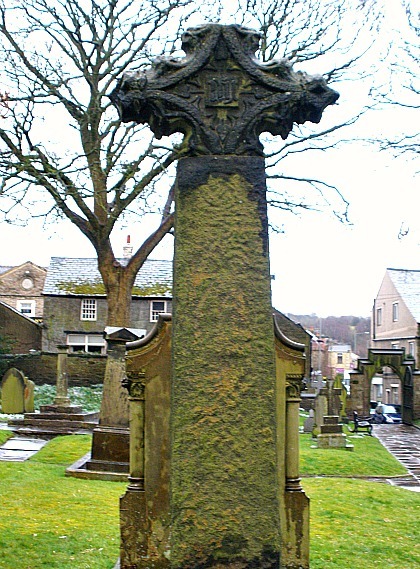 The head of the cross, now badly damaged, seems not to be the original though it looks about right for this particular cross; it may, however, have been the cross-head for Whalley cross no III? The base of this cross is now set beneath the ground perhaps to stop the lean! Cross No II (Near the porch) is by far the best preserved of the three at 2.2 metres high (7 foot 2 inches) and dating from the late 10th to early 11th century. This sandstone cross stands on a large base-stone that is more recent in date. Part of the shaft is apparently missing at the top and the cross-head is badly mutilated although it’s central, carved boss is still quite prominent. The shaft is richly decorated with what is said to be ‘The Tree of Life’ or ‘The Tree of Calvary’ with vine branches going off in both directions and ending in S-shaped scrolls, and there is more scroll-working and zig-zag patterning on both faces and the edges. It’s base-stone also has zig-zag decoration on it’s upper surface. This is undoubtedly a very nice cross to look at and good to photograph when the sunlight is in the right place! 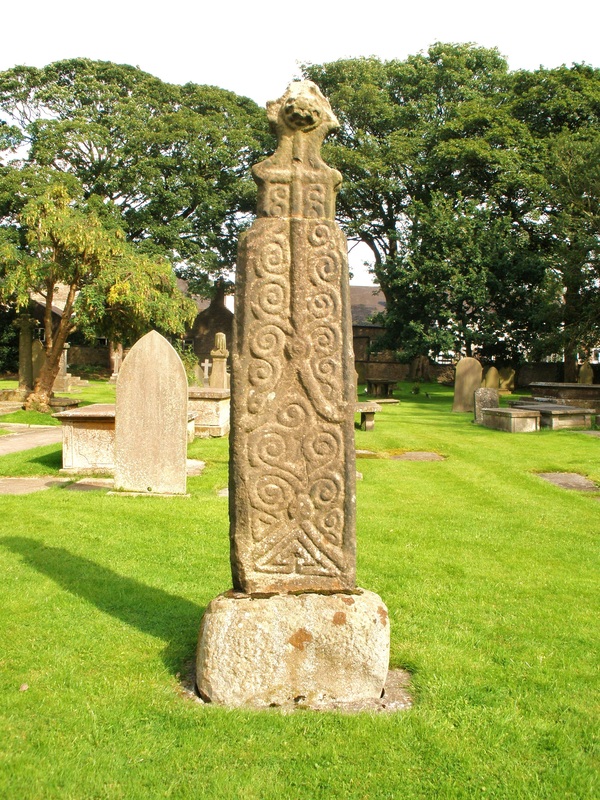 Cross No III (the Eastern Cross) is 2.1 metres high (6 foot 10 inches) and stands in a large oblong base-stone that has two other square-shaped socket holes. Were there originally three crosses similar to a calvary here? The cross is now heavily eroded but traces of Anglo-Saxon carving can still be seen (with a keen eye) on the front (west) face, whereas the opposite face is worn away and showing some damage. The cross-head is not the original – this one being a 14th century Gothic head. Fragments of the original cross-head can be seen in the interior walls of St Mary’s church. The shaft has two figures with haloes stood together half-way up with scroll-work and interlacing above and below all in a pelleted edged-border that show signs of Norse origins. The Gothic head is very ornate and has the letters I.H.S in the centre and a crucifix on the opposite side. Snape, H.C. Rev., The Parish Church Of Saint Mary All Saints Whalley Lancashire England, Church Guidebook (6th Edition), 1978. Fell, Jimmy, Window on Whalley, Countryside Publications Limited, Brinscall, Chorley, Lancashire, 1979. Categories: Ancient Churches / Chapels, Ancient Crosses, The Whalley Crosses in Lancashire | Tags: Ancient Crosses, The Whalley Crosses in Lancashire | Permalink.